Yesterday I read an excellent report on how the water sector in Uganda has managed to build a truly national monitoring system. 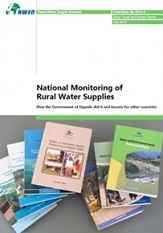 The report is written by the Rural Water Supply Network – RWSN – and so naturally focuses on the rural sector as it looks back at the detailed steps in the development of a framework which has allowed the sector in Uganda to be able to learn about its own performance and take steps to improve how it functions. It really ‘tells the story’ of what it takes to build such a monitoring system and gives insight into one of the most comprehensive monitoring systems that I know of in sub-Saharan Africa. This report is important because it sheds light on the path away from the chronic lack of data plaguing so many sectors when it comes to the provision of rural water services – in many countries, even the most basic data is either lacking or fragmented meaning that good decision making about what and where the problems are and how to allocate resources to solve them is almost impossible. Reliable data and comprehensive monitoring, is one of the most important building blocks that we know of for ensuring that we deliver permanent water services, rather than simply building one-off civil works. Firstly, the report shows how long such an effort really takes – at least ten years and counting as the process of institutionalisation and improvement is still underway – this is way beyond the typical funding cycles of two or three years imposed by many external development partners. The message that strikes me is that there are no quick wins when addressing something this complex; this resonates very well with my own experience with similar monitoring systems in Central America. Secondly, there is a clear factor in favour of the experience in Uganda around staffing and staff stability. This of course touches upon the much wider issues of public sector reform and political interference in civil service functions – that common scenario whereby government officials are rotated so frequently that building any kind of sustained momentum is very difficult. The report captures some of the experiences with how the sector has evolved in its own culture to be much more open to learning – and self-critical analysis – as the result of having this monitoring system in place. Again, this is a tremendously important lesson because by building a sector that can learn and adapt as it goes – and importantly to do so increasingly without ‘external expertise’ – is critical for (rural) water sectors to become self-supporting and independent from external aid. Lastly – and what the report hardly touches on, but what would be very useful for advocacy around this important area – is how much does this all cost? The report says that it is very difficult to disentangle many of the costs from every day work of the ministry as part of the on-going ‘maintenance’ of the national framework (the ‘operating costs’ so to speak). We know this is true from much of the research carried out by projects such as WASHCost and others. But it would be important to say something about the establishment costs (‘capital investment’), such as all the support from external development partners over the early years. Even if these costs are given as upper/lower order of magnitude, it would be very useful to enable a sensible dialogue around this in other countries and with those wanting to fund such an initiative. What is such a positive message is that the Government of Uganda, through the Ministry of Water and Environment has supported this for years and invests its own restricted financial resources into supporting and improving this monitoring system. For other countries that are in the process of establishing or improving such a national system – Malawi being a case in point – this report is essential reading and a great resource.